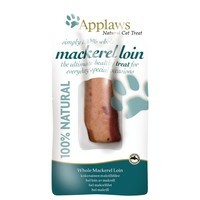 Applaws Whole Mackerel Loin Cat Treat is a nutritious and delicious treat that is packed full of protein and Omega 3 essential fatty acids. Great for the health of your cat both inside and out, the treat can be given either whole or broken into pieces and contains no fillers, artificial flavours or preservatives. Your cat will find these 100% natural treats simply irresistible!